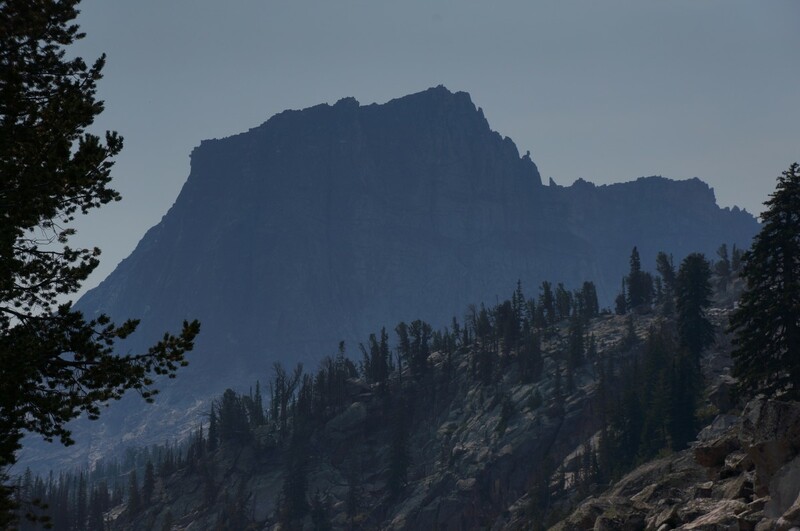 About a year ago, my friend Tom mentioned that there was an alpine wall way back in the Beartooth Wilderness that not only had not seen an ascent, but had no name. He had done a reconnaissance trip in 2009 to see what this thing looked like and exactly what it would take to get back there. He told me about a 20+ mile approach, much of which was off trail and through swamps, down timber and difficult orienteering. Apparently, other parties had tried to access the wall from different locations, but all had been skunked. Often called the Phantom Wall or the Secret Wall, the details were undeniably intriguing. 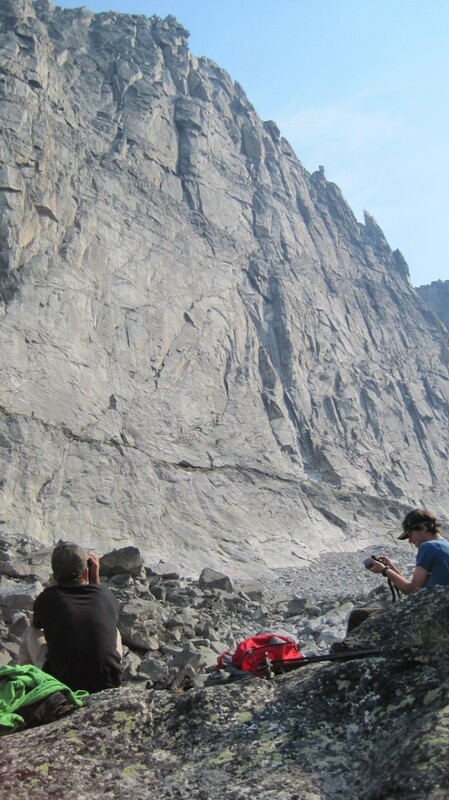 Tom’s pictures showed it to be steep, littered with cracks, and beautiful. I had to at least see it. My enthusiasm grew, which only stoked Tom’s interest in an attempt. Once we persuaded Tom’s brother Pat to come along (an easy sell), our team was complete. Pat’s experience with dreaded offwidth cracks rounded out our skill set and and set us up to handle anything this mountain could throw at us. Since August typically has a short weather window, we decided that a week in the middle of the month would give us the time we need to get to the wall, scope it out and climb. Tom and I emailed photos back and forth, debating potential lines. On the first photo I sent, I had carefully marked the most obvious aesthetic line in red. It was a beautiful dihedral and corner system that went right to the summit- directissema. Pat had also picked out the “Plumb Line”, it was doubtless the gem of the wall. Tom, the only one of us who had seen the wall first hand, sent back a photo back highlighting two other lines on the left of the wall., it was obvious that he thought the “Plumb Line”, as we called it, was a little more than we might be able to handle. We asked ourselves, “What would Fred Beckey do?” We all thought that if we were going to go out that far, we should attempt the best line on the wall. But sometimes, seeing things up close changes your mind. 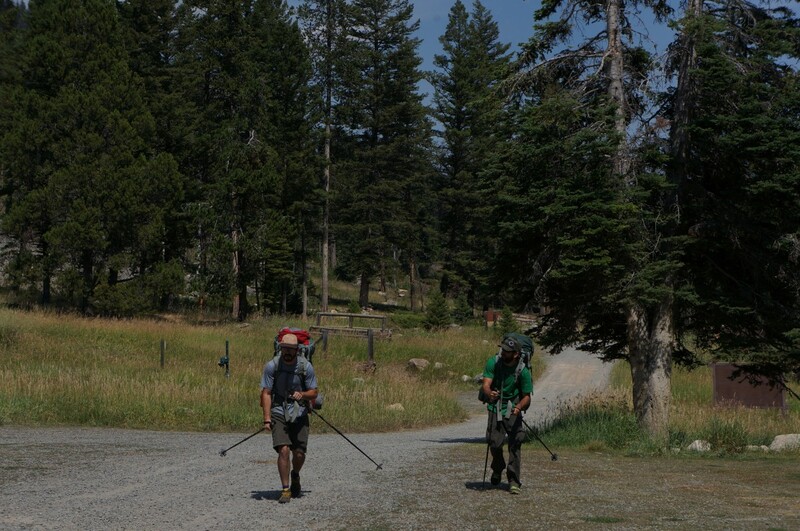 Time passed quickly and we packed up for the adventure- each of us carrying 70 lbs of gear. We drove to the trail head at night and made it a couple miles in, set up camp and tried to sleep. Morning came quickly. The plan for the next day was to get as far down the trail as we could. The first day was a manageable section of switchbacks that gains the famous Lake Plateau of the Beartooths. The landscape here is simply stunning, a backpackers dream. Water everywhere with short distances between each and moderate to no elevation changes. Our destination was on the other side of the plateau, but none of us were complaining that we needed to cross this amazing piece of big sky country. 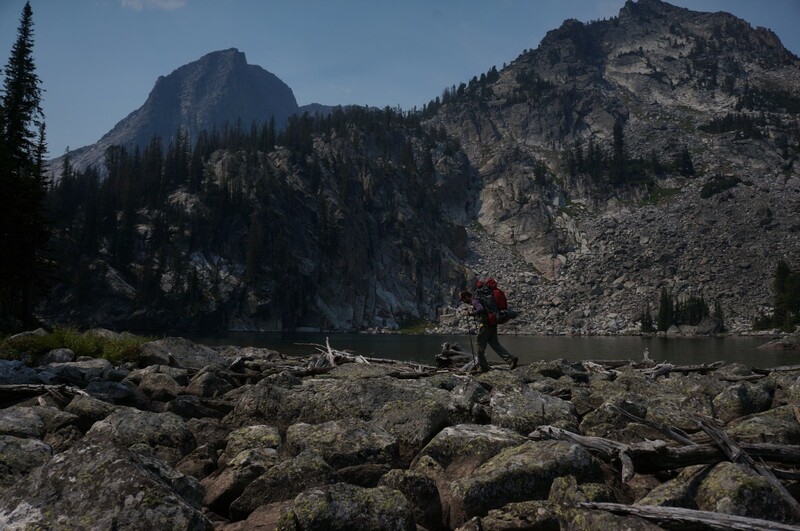 We set camp at Lake Pinchot, about 12 miles in from the trail head, the aptly nicknamed “crown jewel of the Lake Plateau.” I had brought some fishing gear in hopes of supplementing our freeze dried backpacking food with some protein. Luckily, we landed a couple trout, and had some awesome fish tacos for dinner. 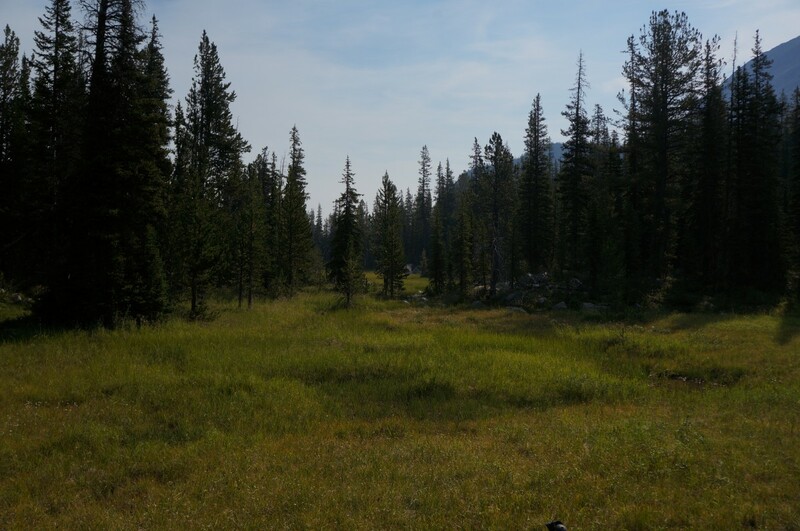 A few minutes of scouting downstream revealed a fishing trail to the left. Tom had gone right- much to his dismay. We avoided that mistake, but knew that eventually we would have to leave the safety of the trail behind. Tom is a master of maps and research. Before we left on our trip, he had found a fish survey from the early 2000’s that mentioned a different path to the wall – or at least somewhere close. 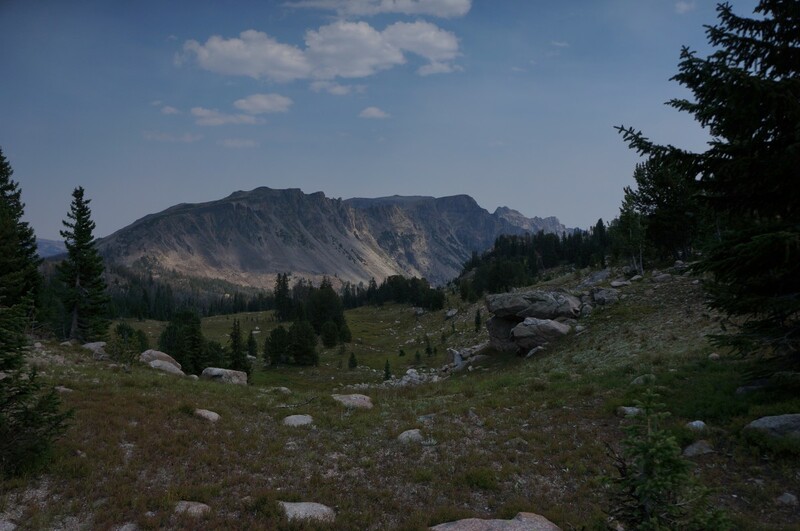 The original route involved losing some elevation and then gaining the drainage to the cirque. 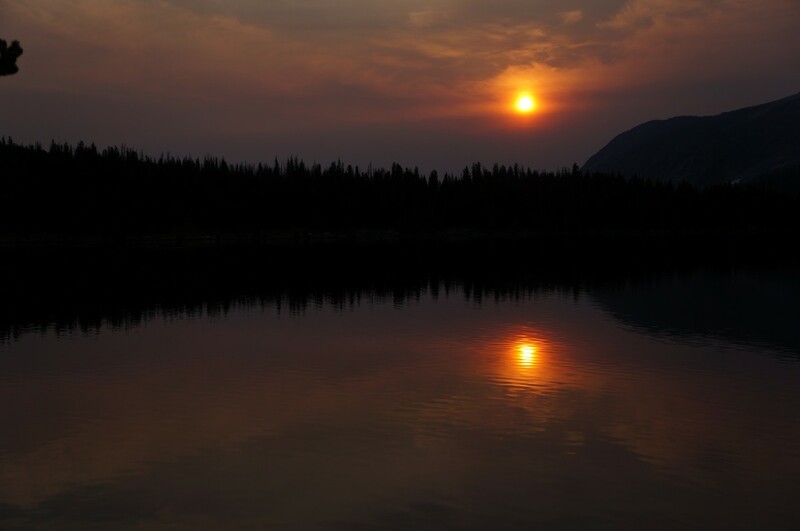 The information that Tom had found looked like a shortcut that led to a saddle above Dryad Lake. Unfortunately, this “shortcut” was steep and full of downed timber and large bands of talus. I am not going to lie, this was brutal with huge packs, but it did save some miles. Regardless, my quads and calves were screaming. Talus hopping with 70 lbs on your back is not easy, and one fall back here, nearly 18 miles from the trailhead, would be big trouble. Tired, exhausted, and annoyed, we made it to the saddle and got our first view of the wall. It was steep, commanding and intimidating even from a couple of miles away. I quickly thought about the gear we’d left at home to save weight. A hammer, hand drill, pitons, bolts… We should have brought a ledge, I thought. That wall is crazy looking and we are miles back here. I let the fear sink in.. The mountains don’t care if I am afraid. 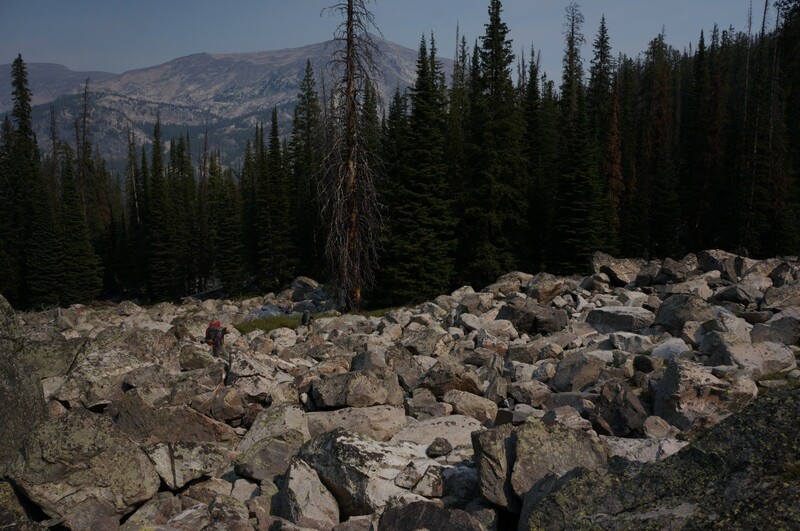 I focused on the remaining talus and bushwhacking to our base camp. 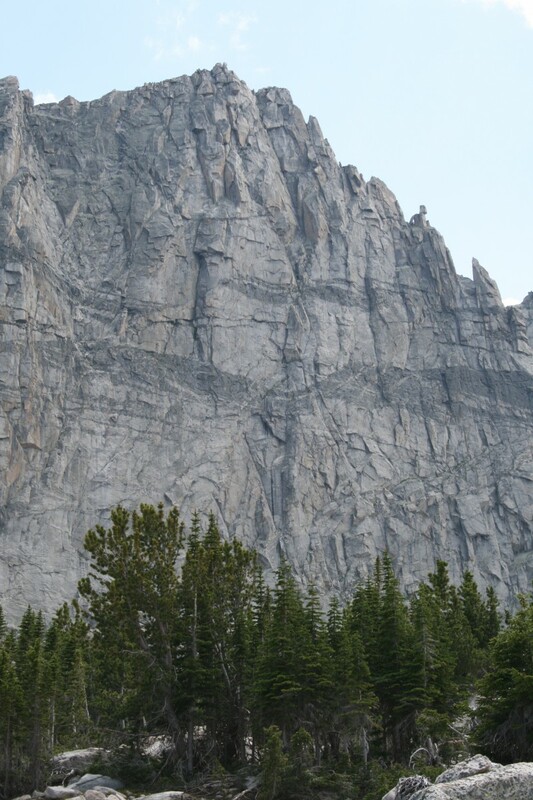 We set up in a small section of meadow at the base of the talus, the wall looming above. 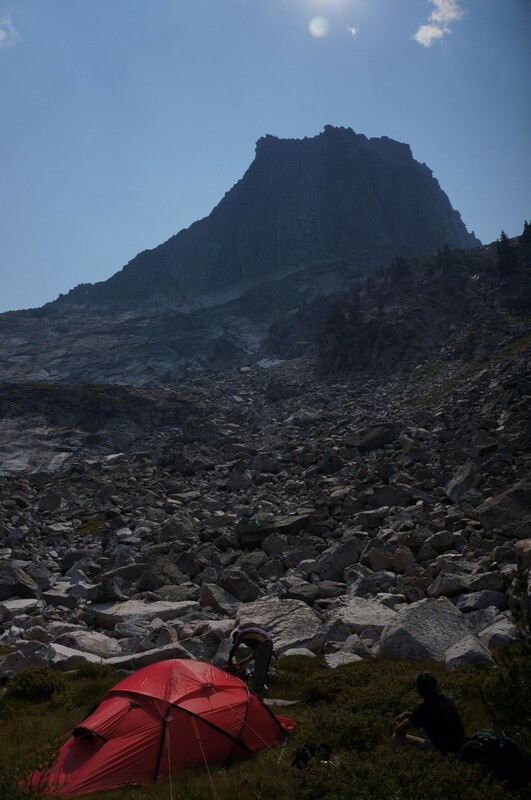 After a short rest, we went up to the base to ferry a load of gear, scope potential lines and get the approach dialed. It became obvious that there were a lot of possible routes, but the “Plumb Line” that Pat and I had spied in the photo still drew our focus. It looked clean and direct and very easy to follow. 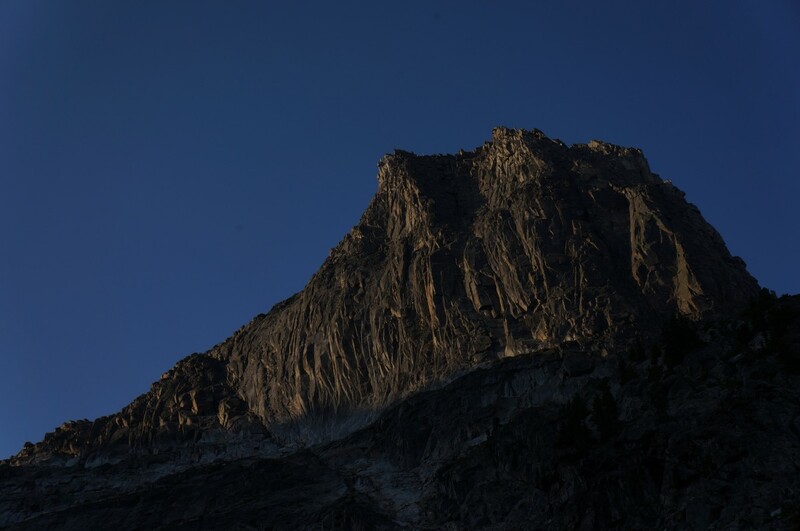 The third pitch looked like it could give us some problems – from the ground it appeared to be a flare or chimney. It looked difficult. We discussed other options, but decided that we had to give the “Plumb Line” a go. What would Fred Becky do? We knew it would haunt us if we didn’t make the attempt. 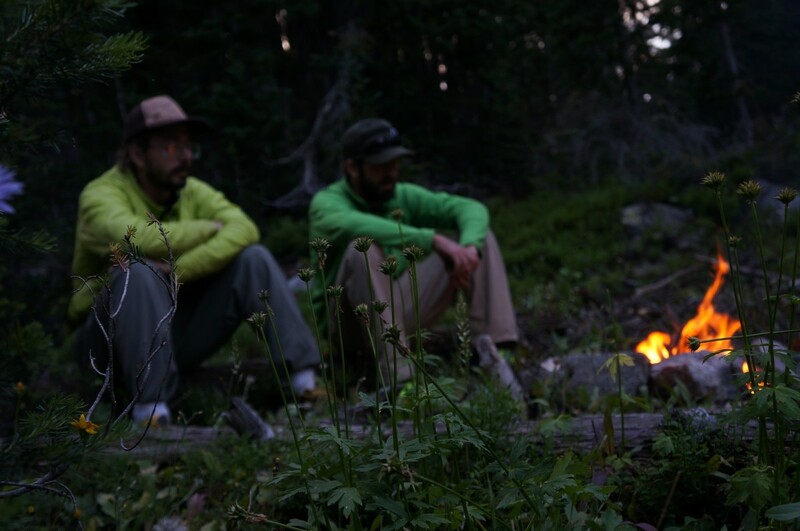 We descended to camp, ate dinner, and tried to sleep despite the anticipation of the next day’s climb. An alpine start got us to the base at first light. I had the first lead. The rock climbed really well, but there were few opportunities to place gear and some very loose blocks. This was not the type of pitch that I wanted right off the deck. I managed to gain a ledge, and belayed Pat and Tom up. 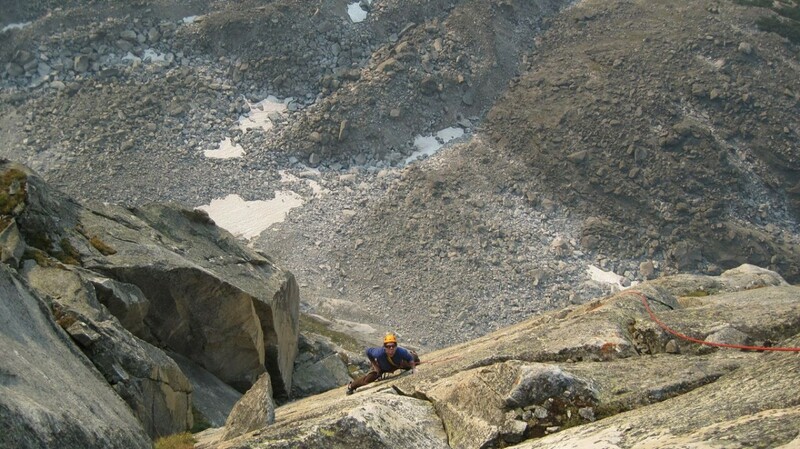 I lead up the second pitch – more of the same. The rock was solid now, but gear was still sparse. Two 5.10- R pitches back to back put my nerves on end. I was glad to make it to the next belay. At this point we were just hoping that the next pitches would offer better protection. The next pitch was Pat’s – a weird wide flare. 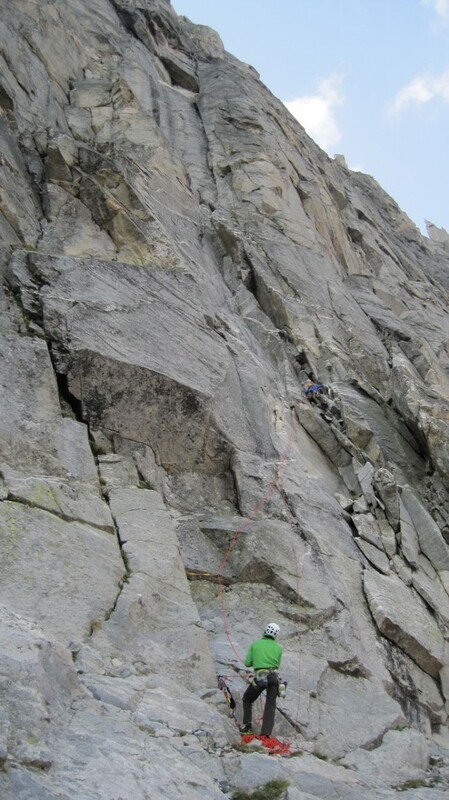 He left the belay ledge and started to climb – chicken winging, heel toeing and pressing his way up. Tom and I followed, struggling, trying to find the right body geometry for the pitch. We both eventually made it to the belay, and while offwidth sizes are not my forte, Pat styled the pitch – it was an impressive onsight. The next section was steep. Pat took the sharp end through a hands sized roof, then into some fun, easy climbing above. We knew if we could get through those two pitches unscathed, success would be likely. Things were looking up for us at this point, and my little fear monger began to quiet down. It was my lead again. 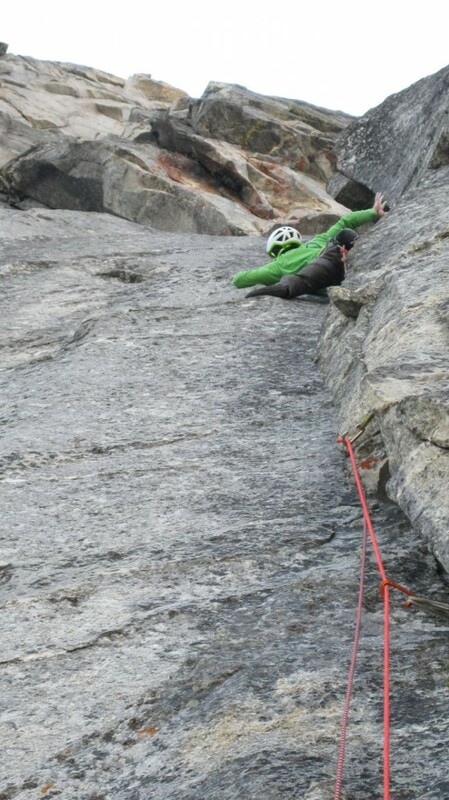 This pitch had looked easy from the ground, and I quickly found a system to the right of the belay and enjoyed some good climbing. The crack ended at a small roof. I traversed left and placed some gear that was a bit suspect. It was obvious that I had no more placements until the ledge above. I summoned my focus and climbed the unprotected section to a dicey mantle, then found a belay in a protected slot. 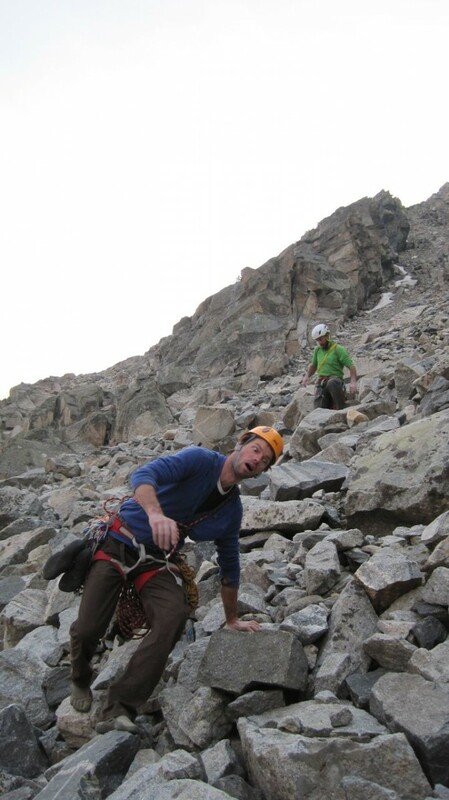 Pat and Tom followed, their eyes widening as they dealt with the traverse at the top of the pitch and the lack of gear. I wish I had photos – their expressions were priceless. The next three pitches went smoothly, though led us to where the dihedral crack system we were following closed down to nothing. Our hopes of an aidless line were quickly diminishing. Pat spied what looked like another crack system to our left. 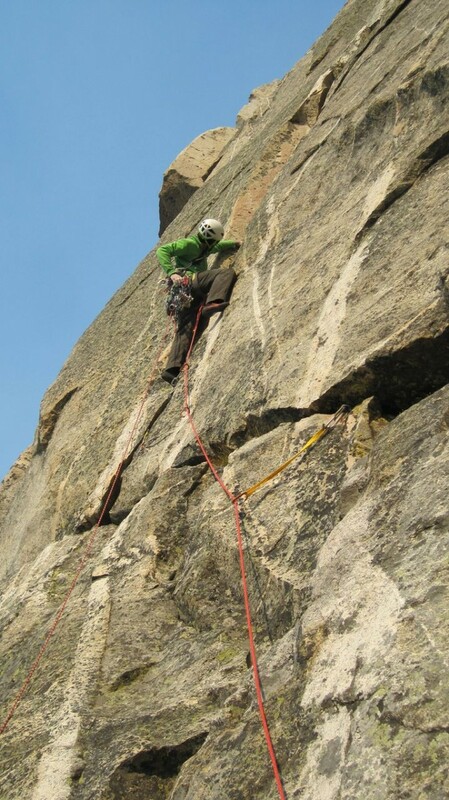 He checked it out and found amazing climbing on excellent golden stone – this pitch might be the real key to the route. But then the crack ended. Out of desperation, and maybe some curiosity, Pat traversed even farther left, on an amazing crystal dike feature, and was able to connect with another crack that led directly to our next belay. This amazing pitch was not difficult, but one of the best and most beautiful that I have done in the high alpine. The climbing flowed so well – it was truly stellar. I got the final lead through a section of wide, placed a #5 Camalot and then motored up easy ground to the airy summit. I let out a huge “WOOP!” It was a strange and amazing feeling, being where no one had been before, and we had done it in great style – onsight and with no fixed gear. I belayed the others to the top, and we took in the view. We slowly made our way down the back side, through miles of talus to our camp where we celebrated by stuffing our bellies and sipping whiskey. We named our new route The Great Bear (5.11c R, 10 pitches), and decided to name the wall the Pisce Wall after the lake located at its base. Now we just had to get down to camp and back to civilization. 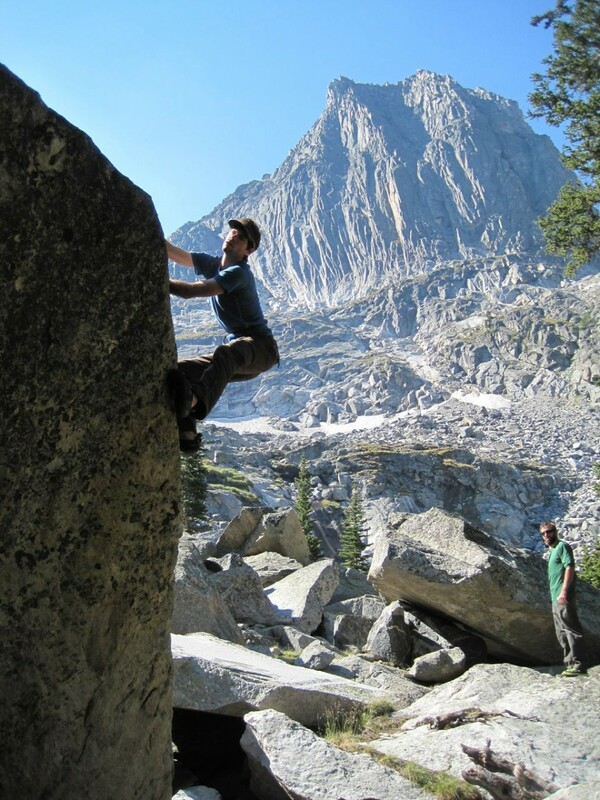 The day after our ascent, we did some bouldering on the large blocks in the talus field and attempted to fish at Lake Dryad. We noticed a large plume of smoke to the West of us and ash began to fall like snow on the water, probably scaring any potential catch back to the bottom of the lake. We had no way of determining how far away the fire was, but the tent got a dusting of ash that left us wondering about the hike out. If we had to find another way because of the fire, it would certainly tack on some miles. We went to sleep nervous, to say the least. Though we were apprehensive about the fire, we decided to add a couple lakes to our tour out. Adding miles seemed inconsequential now that our objective was complete. 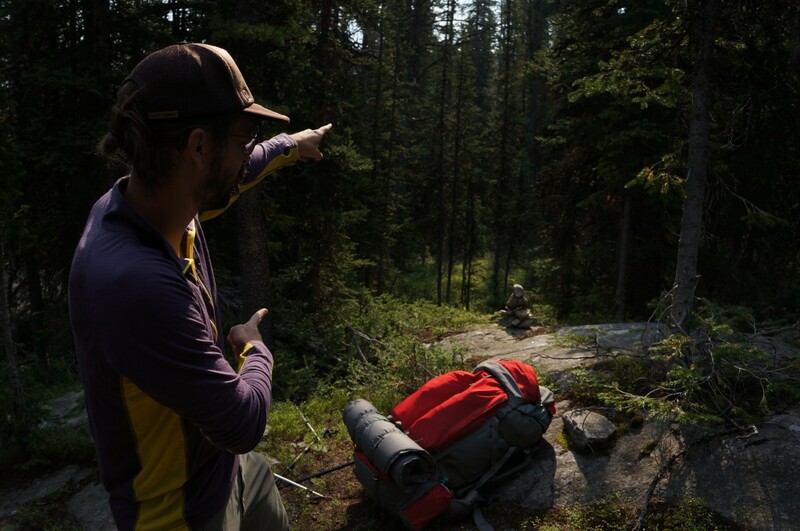 Tom was smart enough to put in a waypoint to mark where we had left the trail on our way to Dryad Lake. This made navigating back to the trail easy, but we were pretty beat up. 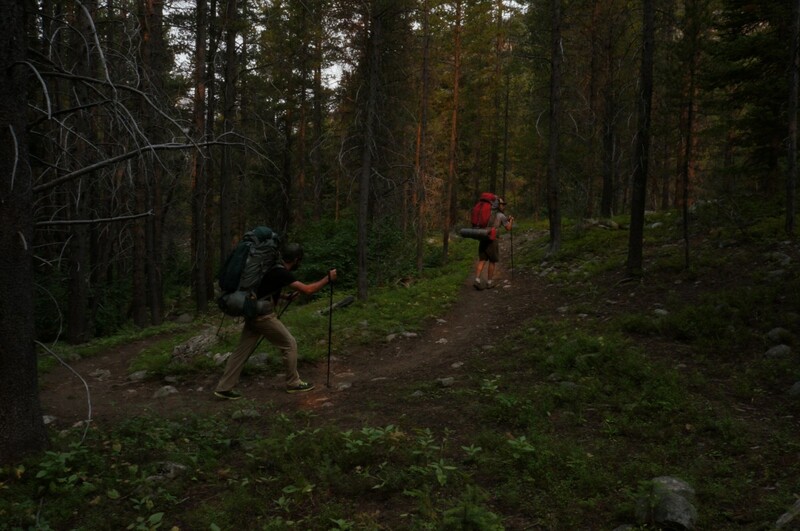 Even with lighter packs, bush whacking back to the trail was a chore. 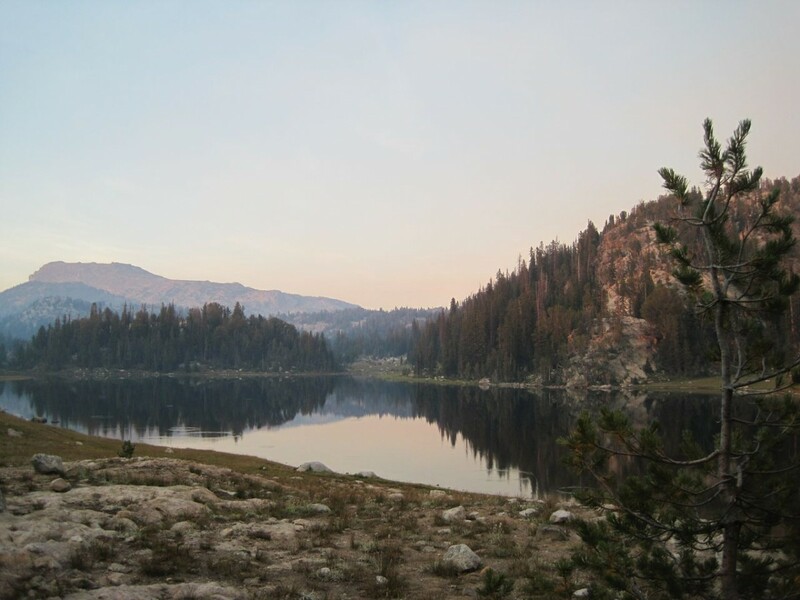 We made our way back to Lake Pinchot, then to Rainbow Lakes where we setup our final camp. Ash fell sporadically, but at this point it was obvious that the fire was far off. We felt safe at Rainbow Lakes, and caught fish for tacos once again. We finished out our lake tour early the next afternoon and made our way back to the cars. After 45+ miles of hiking, a 1,100 foot wall first ascent and 21 lakes, this was one for the books. 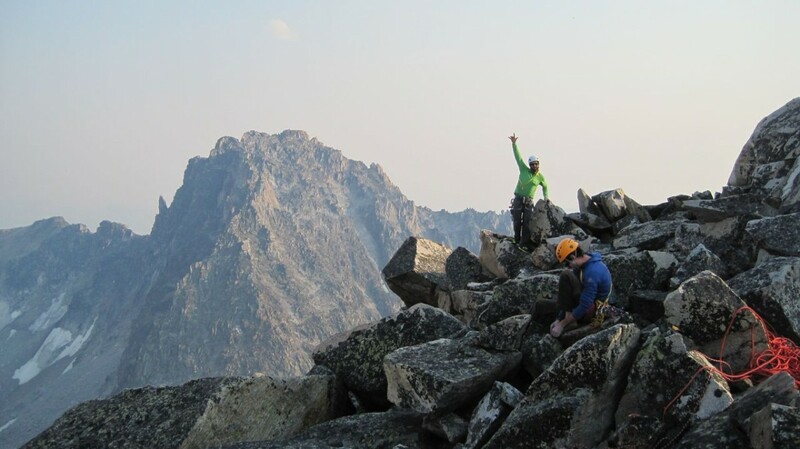 Special thanks to the American Alpine Club for awarding us a Live Your Dream Grant, Hilleberg Tents and, of course, Mystery Ranch. Without their help this epic mission would not have been possible.